Hero BX and the future of Lake Erie Biofuel. Trucks and trains quietly roll in and out of the biodiesel refinery on East Lake Road. To its west sit the long smokeless stacks that were once the symbol of prosperity at Hammermill/International Paper, and to its east, the open waters of Lake Erie. Each day people drive under the railroad trestle on which unmarked black tanker cars are pulled into the facility, carrying tens of thousands of gallons of used cooking oil, animal fats, and chemicals: the raw materials that later leave the facility in nondescript tankers with the day's payload: Hero BX biodiesel. Lake Erie Biofuels, which does business as Hero BX, is one of the top ten biodiesel producers by volume in the country. Capable of producing 50 million gallons of biodiesel a year, it's one of the bright spots in the Erie economy, grossing more than $15 million in annual sales. 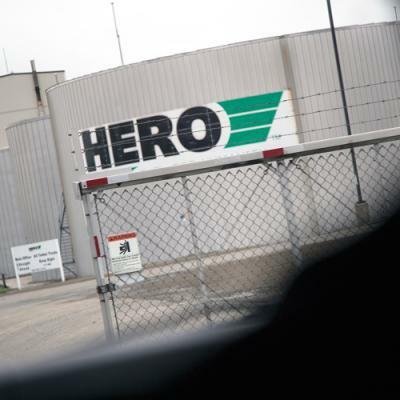 Hero BX is a wholly owned subsidiary of Black Family Holdings, LP, and as the easternmost biodiesel producer in the U.S., it's literally positioned itself to be a powerhouse in biodiesel production. Nearly half of Hero BX's biodiesel fuel stays in Pennsylvania and is blended with petroleum fuel to become part of the diesel fuel used in vehicles in western Pennsylvania. So, if you buy diesel fuel at Kwik Fill or Country Fair, you're burning local biodiesel. Nearly half of its biodiesel fuel stays in Pennsylvania and is blended with petroleum fuel to become part of the diesel fuel used in vehicles in western Pennsylvania. So, if you buy diesel fuel at Kwik Fill or Country Fair, you're burning local biodiesel. The other half of Hero BX biodiesel either goes into the northeastern U.S. as home heating fuel or into the southeastern U.S., where it's primarily used as transportation fuel. Part of the Hero BX strategy is leveraging its location against those of its competitors. "This business is all about economies of scale," says Chris Peterson, vice president of finance and commodity risk. "Eighty-five percent of the cost is in our raw materials. It's the rest of the costs that we have to manage." Transportation is a major part of the remaining costs. So being the easternmost biodiesel producer along major rail and ground transport corridors helps to keep those costs in check. When the firm began in 2005, 90 percent of its product went into European markets. But in 2009, the European Union imposed tariffs on U.S. made biodiesel that closed those markets to U.S. producers. Hero BX needed to reevaluate its strategy. It did that by developing new markets up and down the east coast. But to remain profitable, Hero BX needed to manage its costs. "If we were going to make a domestic market we had to be more cost effective," Peterson recalls. "We had to use cheaper materials which meant that we had to retrofit the plant and the process to handle cheaper, lower grade materials, like cooking oils and other waste greases." Originally, the biofuel was 80-90 percent vegetable oil and 10-20 percent animal fats. That had to change because, as in the petroleum industry, profits are pennies on the gallon. With the help of its in-house million dollar laboratory that refined the chemistry of its biofuel, and maximizing the returns on its biodiesel as well as the byproducts it yields, Hero BX recovered from its transition as a foreign manufacturer to a domestic producer. That process took almost 18 months. "Mechanically, we were changing the plant and up here in the office we were changing our business plan and our strategy. It was pretty hectic in 2009-2010," Peterson says. Then came another hit: Foreign producers were granted subsidies by both their home countries and the U.S., and the home heating oil market became aggressively more competitive. Hero BX was again forced to search for new markets for its product. "We're competing against double subsidized product. We used to sell quite a bit of our capacity into New York Harbor," says Peterson, "but we made a conscious shift in our marketing strategy to develop markets in the southeast." That successful move into the southeast prompted the purchase of a biodiesel refinery in Moundville, Ala. last November, now giving Hero BX an easternmost foothold in the southeast as well as the northeast. It's the former Veros Refining facility with a 15 million gallon per year capacity. According to Peterson, it wasn't sustainable as a small refinery. But as a complement to Hero BX's Erie facility, he thinks it will work. "As a standalone 15 million gallon plant, it didn't survive because you still have to have your equipment people, your procurement people, accounting, human resources. We'll do all that from Erie," he says. "We'll manage all of that back-of-the-house functionality out of the Erie office, then it's just the production cost in Alabama. 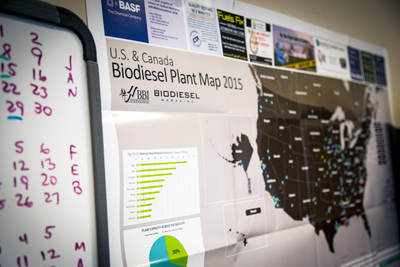 It may be a little bit of patting ourselves on the back, but we think we're pretty good at running a biodiesel plant." 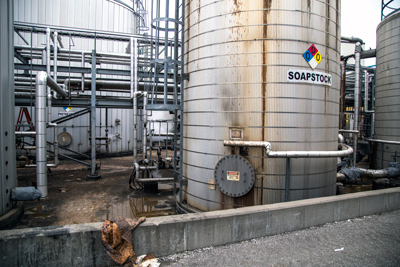 Hero BX produces roughly 160,000 gallons of biodiesel every day. The raw materials come into the facility by truck and rail. Each truck holds about 7,000 gallons of materials, such as vegetable oil, cooking oil, or animal fats – base materials known as feedstock – or the chemicals used to refine the feedstock. Each rail car has the capacity of seven trucks. Both trucks and trains haul materials into the facility five days a week, unless demand calls for an extra day of production. The plant runs on two 12-hour shifts, which Peterson says is more efficient than the downtime created by three shift changes per day. The average laborer earns a salary in the mid-$50K to low-$60K range with bonuses and overtime. The feedstock goes through a multi-step process where it is treated to remove impurities, such as metals and other contaminants. Those purified oils are then combined with methanol or other industrial alcohol before a catalyst is added to create a chemical reaction between the feedstock and the methanol. That reaction produces two different products that separate naturally in the production process, making multiple product streams and, more importantly, two profit streams: biodiesel and glycerin. The biodiesel, of course, becomes fuel. "There is a mandate in Pennsylvania that all transportation diesel contain a minimum of 2 percent biodiesel and in the western part of the state that's met mostly using our product," Peterson says. "That's why so much of it stays in state." The glycerin gets sold to any number of vendors for use in the pharmaceutical industry, cosmetics, and even animal feed, among others. Aside from diatomaceous earth, a soft natural powder that's used in the filtration of the biodiesel, there is virtually no waste in the production process. For every 100 pounds of feedstock, 10 pounds of methanol is added to produce 100 pounds of biodiesel and 10 pounds of glycerin. The matrix that is the refinery is connected by nearly four miles of pipe and three miles of wire, installed primarily by Erie contractors William T. Spaeder Company and Keystone Electric Construction. The most visible and notable components of the 13-acre facility are the seven million gallons of tank storage adorned with the Hero BX logo visible from East Lake Road. Peterson says the company will almost double in size with the addition of the refinery in Alabama. There are 43 full time, living-wage-earning employees at the Erie facility. The rest of the jobs will be in Alabama, where the refining process will require more manpower because the facility is not as technologically advanced. If the Moundville plant is profitable after the first year, Peterson hopes to expand. "We're on 13 acres here," he says. "That facility is on 55 acres. There's a lot of room to grow down there." If the aged southern plant is capable of matching the quality thresholds set in the Erie facility, Peterson believes it could scale to 20-25 million gallons, giving Hero BX a larger presence in the biodiesel marketplace. "We've got customers waiting for production from that plant and we'll have customers fighting over that production," he anticipates. The Erie facility also has room to grow. Hero BX has received support from the Erie delegation in Congress, and the current EPA volume mandates ensure that biodiesel will be part of the American diesel pipeline at least for the immediate future. Much of that anticipation rests on variables that are outside of the company's control. Just as Hero BX was forced to evaluate its strategy in 2009 when European markets closed because of tariffs and the domestic home heating market was limited because of subsidies for foreign producers, federal volume mandates and excise tax credits for biodiesel will, to date, expire at the end of 2016. "We're a heavily regulated business," Peterson laments. Nevertheless, Peterson remains optimistic. He says the company has received support from the Erie delegation in Congress, and the current EPA volume mandates ensure that biodiesel will be part of the American diesel pipeline at least for the immediate future. It's a challenging path, to be sure. But Hero BX has navigated such obstacles before and, so far, with great success.